A reorganisation of the CD shelves has just been completed. Probably a pointless exercise since it's looking increasingly unlikely that I'll be able to stay in Singapore after the end of the year – there just isn't enough work here for a man of my limited talents – but a necessary one since the collection has now exceeded the 13,000 mark. Having all those CDs lying around on the floor and being checked off against the catalogue drew my attention to some forgotten members of the Rochester Collection, not least those at the very top left hand and very bottom right hand corners in a collection arranged numerically and alphabetically. 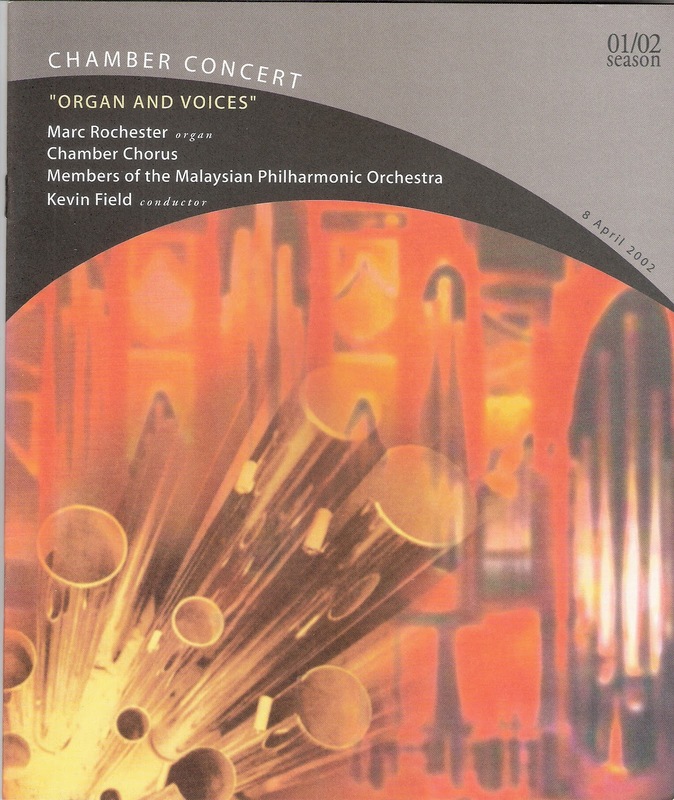 Interestingly, those discs at the extremities came with stories closely connected to my time with the Petronas Philharmonic Hall in Kuala Lumpur. For the bottom shelf, you will have to wait! Coming in at the top left hand corner, however, with the catalogue numbers 00-00341 and 00-00549 were two discs of piano music played by Craig Sheppard on the German-based Annette Tengermann (AT) label. They were both given to me by one of the most loyal, dedicated and kindly choral singers I have ever had the privilege of working with, Judith Blake. In June 1999, James Judd (and one could write a substantial chapter on the sorry saga of his involvement with the MPO, but that's probably best left to submerge beneath the waves of time) conducted a performance of The Planets. The problems the Americans had in getting their space programme underway were nothing to what we went through to get a ladies' choir together for the final movement. It all but fell apart and, in the concert post-mortem, it was decided that we should get a pool of singers trained and ready for occasional performances when a chorus was needed. This, of course, ran against an objection many Muslims have to singing on stage, and a very delicate line had to be struck – after all the hall was specifically designed not to accommodate a choir. However I assembled a group of some 50 voices and, over the course of the next two years, got them to a fairly acceptable standard. We decided to launch ourselves with a choral concert on 8th April 2002. It couldn't be a true choral concert as this would have caused some issues with the authorities, who did not want to annoy the more fundamentalist Islamic leaders from the east coast states (from which the vast bulk of Petronas oil was extracted), so we did it as a kind of piggy-back on one of my early evening organ recitals. Less than a month before the concert, I was told to submit a list of choir members. "Too many foreigners", I was told, "Bring in more Malaysians". How, after two years' training, I could sudden conjure up a group of locals and get them to sing well defies the imagination; but it is typical of the astonishing musical ignorance which has always plagued DFP management. When I said that wasn't possible, I was told to axe the foreigners. That would have left me with a choir of 20 and I refused. A fortnight before the concert, I was told that only foreigners with Permanent Resident status or with valid work permits could be allowed to perform on stage, others would need to revoke their current Malaysian visas, apply for a permit allowing them to perform at a public concert, and then reapply after the event to revert to their original status, which was by no means guaranteed. When it became obvious that, during the process of applying and re-applying, they would need to leave the country, the concert looked doomed. The wife of the then German Ambassador to Malaysia, one of my sopranos (holding a diplomatic passport and therefore no work permit), was outspoken in her condemnation of all this and expressed her resentment to her husband. In an act of astonishing ineptitude, he, without checking any facts with anyone at DFP, wrote a letter to the national press accusing Malaysia of racism, which caused a considerable stir in the DFP office. Not long afterwards, the German Ambassador was recalled (coincidence? ), but, through patient argument (not my strong point), and a concession that the choir would not be called, as originally intended, the MPO Chorale, we were able to let the concert go ahead with most of the original choir, but on condition that it would be disbanded immediately afterwards and never perform on the DFP stage again. As all this saga unfolded Judith remained a tower (more a mountain – she, like me, was not the most svelte person in the world) of strength and dependability, always optimistic and seeing a solution to every problem. In gratitude, after the concert, she gave me two CDs by Craig Sheppard. She had heard him perform some years earlier and been so moved she had bought all his CDs. By giving two of them to me, she was sharing something very special, and I was deeply moved by her sacrifice. It would be nice to report that I, too, found the CDs deeply moving, but at the time I was not bowled over by them and, sadly, have left them to fester on the top shelf. Until now. Prompted not only by the memory of Judith's loyalty and immense kindness, but by the fact that Craig Sheppard was in Singapore a couple of weeks ago giving a masterclass to Yong Siew Toh students, I have taken the trouble to revisit this pair of CDs. If, back in 2002, I found Sheppard's approach to Bach too dry and technical, I have obviously become more attuned to this style of Bach pianism since then, for I love the way he mulls so intensely over every phrase, and I simply adore the nimbleness of his articulation in the brisker of the "Goldberg" Variations. Some of his dynamic extremes and rallentandi seem a little overbearing, but this was obviously a live recording, and I can imagine it would have had a spellbinding effect in the hall (it was recorded, I see, in the Berlin Philharmonie in April 1999). The overriding impression I get of Sheppard's Bach playing is of intense musicality with a vivid consciousness of textural intricacies. His fugal playing (in var.4, for example) is spellbinding, his ear for balance and his subtle nuances of touch little short of brilliant, and his innate pianism making it all sound perfectly suited to the instrument, even if he is a little over-inclined to exaggerate Bach's virtuoso writing (as in var.14). 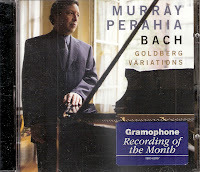 He misses out the repeats – which means his Goldberg takes 43 minutes compared with the 73 of Murray Perahia (on Sony Classical SK89243) – and neither the recording nor the piano itself has the all-embracing warmth of Perahia's, but I think I marginally prefer Sheppard simply because it has such a feeling of vitality and because, as this is genuine harpsichord music (which you can't say about everything Bach wrote for the keyboard), he has clearly informed his performance on harpsichord technique. The second disc could not be more different. Juxtaposing the 24 Preludes of Chopin and Scriabin, his playing is, while technically very impressive, a little dry and impersonal. He has a wonderful sense of texture, and balances the musical strands superbly, but, while Chopin is not up there among my favourites, I do feel his music warrants a little more emotional weight than it gets here; the G major (Op.28 No.3) has all the character of a Bach Toccata, while the ensuing E minor comes across entirely in the manner of Bach's organ chorale prelude "Erbarm dich mien" (BWV721). Similarly the Scriabin Preludes (which I do love) have a detached, impersonal feel. Again, texture is impeccably delineated and technical detail delivered with absolute precision, but it is playing without soul; except, possibly, for the magical way he interprets the closing bars of the B major. Perhaps Sheppard was distracted during the performances, recorded live in Seattle in October 1994 and May 1995, by an audience unable to restrain their substantial bouts of coughing, but my feeling is that, when it comes to this romantic repertory, Sheppard is not the most persuasive of advocates. When it comes to Bach, he is second to none, and this particular disc is not going to be allowed to gather much more dust in Singapore or anywhere else.